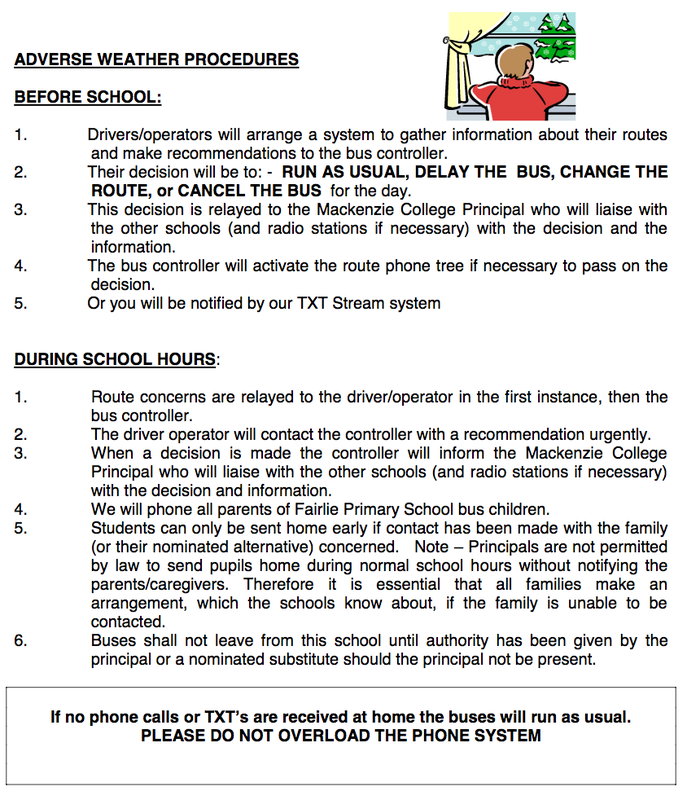 The Bus Controller, Mrs. Michelle Moore from Mackenzie College, is responsible for the day to day running of the seven school buses. Please contact her at Mackenzie College 03 685 8603 to enrol your child for the bus or if you have any questions or concerns about the buses. A School Bus Service is provided free for all pupils who live further than 3.2 km from the school. This increases to 4.8 km when the child turns 11. Children are expected to inform the bus monitor if they are not travelling home on the bus. In the event of an early school closure and the buses being sent home early, all parents of bus pupils, where possible, will be contacted by phone - please refer to separate document - (﻿Adverse Weather Procedures﻿). PLEASE NOTE. Often the buses are earlier in the morning if there are no Mackenzie College pupils.